If you’re a normal, functioning person, you may not be acquainted with the term “executive function.” The key word is “executive,” as in the sentence, “Executives make more money than their employees do.” But during the seventeen years I worked in conventional office jobs (1998-2015), I became acutely aware of my strengths and weaknesses. After a long period in academia in my late twenties and thirties, usually up to my neck with work without much compensation, let alone job security, I was hired as a copy editor at a company that was just beginning to expand. My timing couldn’t have been better—or luckier. It was the only job of mine in which I felt I was being overpaid. After the dot-com bubble collapsed in March 2000, things slowed down, but not for long. My boss had the judgment to sell the company at an opportune time, and, for those of us who had been around for a while, and had a good deal of responsibility, he rewarded us generously. The new ownership was quite different. From day one, I sensed that my job was in jeopardy. We had been sold to a conglomerate, called Wicks, and, ironically, we were purchased by a private equity firm—the subject of our publications. The irony quickly grew thin. It was clear that my function, as a copy editor, could be accomplished elsewhere within the wider organization. In the emerging world-is-flat economy*, my role could be handled within Wicks’ central office. When I introduced myself to the new chief executive that morning, he happened to be eating from a bowl of cereal, and showed no sign that he wanted to become acquainted with me. At home, I had a two-year-old daughter, and Paula’s income at the time was scant. I managed to survive for another two years, by which time the company had been sold again, this time to Dow Jones—a much more reputable organization than Wicks, but one that still left me at risk of seeing my job eliminated. It was not until my going-away dinner in December 2004, after I’d secured a job in downtown Boston, did I learn that Dave Barry, my supervisor, working behind the scenes, saved me from my copy-editing position being eliminated. Dave’s argument was that my editing was essential to the quality of our publications. Only once I started my new job, in downtown Boston, at the Massachusetts Municipal Association, did I fully grasp just how easy my previous role had been for me. During my seven years working west of Boston, I rarely worked more than eight hours. And editing had always come easy to me. A colleague of mine once introduced me as “Super-copyeditor.” My job was tedious, yes, but stable. But outside of writing and editing, my range of professional skills were limited. And that was the case long before Alzheimer’s introduced itself. My dad, as I learned many years after the fact, struggled as a junior high school teacher. His organizational skills were subpar. But in a semi-retirement that lasted decades, he became an extremely popular figure as a substitute, even among the middle school kids. An accurate statement in one of my later performance evaluations at the Massachusetts Municipal Association, where I worked at for just over a decade, was that I tended to work in isolation. Had not my problems grown into Alzheimer’s, I still might have struggled with complex administrative tasks, such as managing our 200-page-plus municipal directory. And, it’s no surprise, these days, two years after I got my diagnosis, I continue to observe the erosion of my executive function skills. My cooking, for example, is limited to simple recipes, such as rice and beans, and seafood that I can prepare in a Pyrex oven dish. And I’ve always had a poor sense of direction—possibly caused by the concussion I suffered around the age of six, during which I didn’t come to for at least fifteen minutes. Among the likely consequences of that one concussion, a half-century ago, included what appears to be a permanently compromised sense of direction. Once, in Brooklyn, in 1985, I led two friends, one of them limping, into the heart of the Bedford-Stuyvesant neighborhood, back when Billy Joel’s song was code for don’t go there. These days, I have learned, the message is, You’ll never afford the rent. The brain, like other organs, tends to show some wear and tear as a person ages. The aging can be particularly disconcerting if you fear your condition could bloom into dementia. A Harvard Medical School publication I recently dredged up delineates the steps that people in their sixties and beyond can take to maintain good mental hygiene. As many people understand, regular exercise brings multiple benefits. A study in 2010 involving more than 13,000 women indicated that getting the most exercise at age 60 were roughly twice as likely to became what the article described as “successful survivors”—those who live beyond 70 “without developing cognitive, physical, or mental health limitations or a major chronic health problem.” The women scored higher on “executive function” skills—being able to prioritize decisions and then implement them. Exercise habits were studied as well. One finding: “Older men who walked less than a quarter-mile per day were 1.8 times more likely to develop dementia” than those who walked more than two miles each day. The article also highlights the importance of lifelong learning. 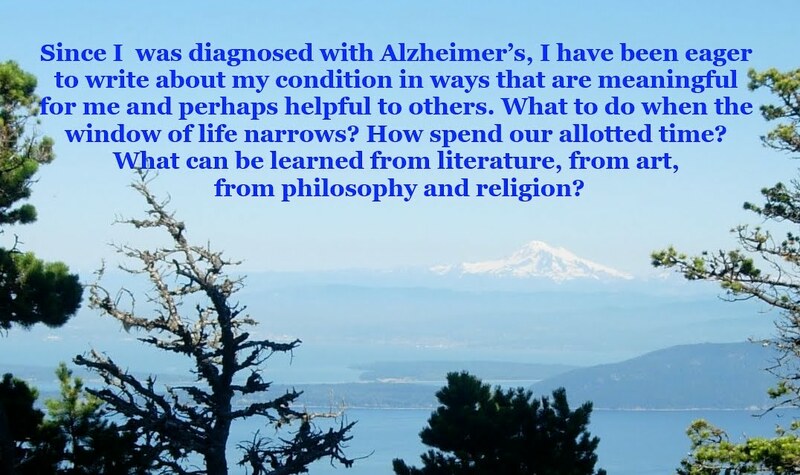 One major misperception about Alzheimer’s is that once you’ve been diagnosed, you’re not likely going to be learning much new. The Alzheimer’s Association makes a point to arrange outings to art museums and theater performances, among other activities. And I remain a voracious reader. I meet with a friend on a regular basis to discuss books. Occasionally I will read from one of my books that are written in German. This is toilsome. But it’s another way to exercise my brain. After an hour of reading German, I’m mentally exhausted, and ready for sleep. One topic—managing stress—is particular relevant to me. In my last two years of employment, I was frequently anxious, and for good reason. I knew that my job was hanging by a thread. Once I learned that I had Alzheimer’s, I started to relax. But it took a full week or more for me to decompress and feel like my normal self again. Note: My next post will appear on Friday, August 18.